Our solar system’s shadowy ninth (dwarf) planet was the subject of furious speculation and a frantic search for almost a century before it was finally discovered by Clyde Tombaugh in 1930. And remarkably, Pluto’s reality was deduced using a heady array of reasoning, observation and no small amount of imagination. The 18th and 19th centuries were thick with astronomical discoveries; not least were the planets Uranus and Neptune. The latter, in particular, was predicted by comparing observed perturbations in the orbit of Uranus to what was expected. This suggested the gravitational influence of another nearby planet. John Couch Adams and Urbain-Jean-Joseph Le Verrier calculated the orbit of Neptune by comparing these perturbations in Uranus’ orbit to those of the other seven known planets. Neptune was hence discovered in the predicted location in 1846. Soon after this, French physicist Jacques Babinet proposed the existence of an even more distant planet, which he named Hyperion. Le Verrier wasn’t convinced, stating that there was “absolutely nothing by which one could determine the position of another planet, barring hypotheses in which imagination played too large a part”. Despite that lack of evidence for perturbations in Neptune’s orbit, many predicted the existence of a ninth planet over the next 80 years. Frenchman Gabriel Dallet called it “Planet X” in 1892 and 1901, and the famed American astronomer William Henry Pickering proposed “Planet O” in 1908. In addition to the perturbations of known planets there were other hypotheses that foretold unknown bodies beyond Neptune. In the 19th century, it was understood that many comets had highly elliptical orbits that swung past the outer planets at their farthest points from the sun. It was believed that these planets diverted the comets into their eccentric orbits. Pluto is not only distant, but it’s small. That makes it very difficult to see from Earth. In 1879 the French astronomer Camille Flammarion predicted a planet with an orbit 24 times that of Earth’s based on comet measurements. Using the same method, George Forbes, professor of astronomy at Glasgow University, confidently announced in 1880 that “two planets exist beyond the orbit of Neptune, one about 100 times, the other about 300 times the distance of the earth from the sun”. Depending on how the calculations were done, the results predicted anything from one to four planets. Other predictions were based on what can be described as numerical curiosities or speculations. One of these was the now-discredited Bode’s law, a sort of Fibonacci sequence for planets. The American mathematician Benjamin Pierce was not a fan, claiming that “fractions which express the law of vegetable growth” were more accurate than Bode’s law. As well as these earnest astronomers, the trans-Neptunian planet idea attracted cranks and visionaries. An interesting contribution came in 1875 from Count Oskar Reichenbach, who accused Le Verrier and Adams of conspiring to conceal the locations of two trans-Neptunian planets. Theories and calculations were all well and good, but many hoped to actually see the hitherto invisible planet(s). From the late 1800s new powerful telescopes equipped with the latest dry-plate photographic technologies were employed to search for undiscovered planets. 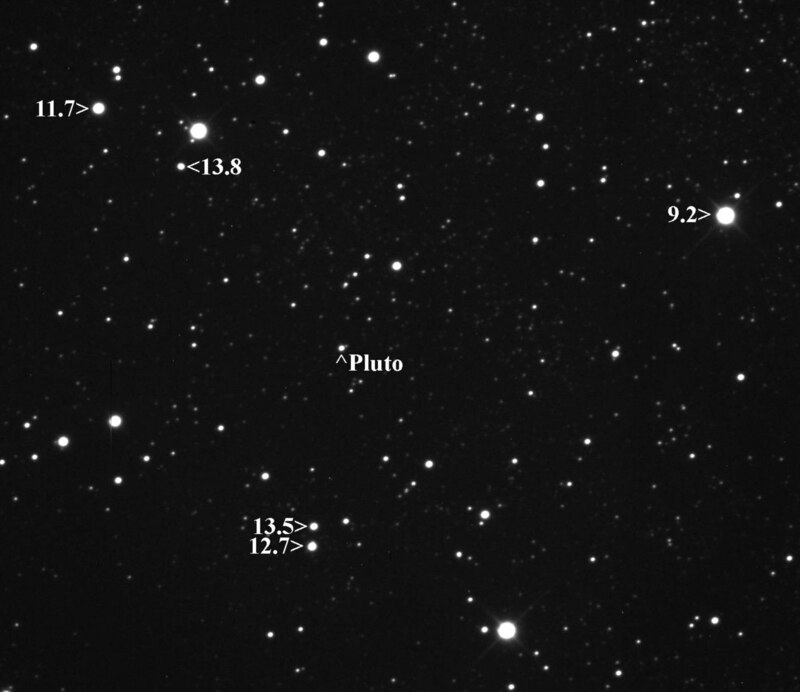 Pluto isn’t easy to spot. This 10 minute exposure shows the apparent magnitude of Pluto compared to some nearby stars. Amateur astronomers such Isaac Roberts and William Edwards Wilson used the predictions of George Forbes to search the skies, taking many hundreds of photographic plates in the process. They found no lurking trans-Neptunian planets. The professionals fared no better. Edward Charles Pickering, director of the Harvard Observatory and William’s brother, spent around ten years from 1900 searching using his own data and those of earlier astronomers such as Dallet, all to no avail. In 1906 a new approach was introduced by the veteran astronomer Percival Lowell. Although best known to us for his (mistaken) observations of canals on Mars, Lowell bought a new rigour to analysing the orbit of Uranus based on observational data from 1750 to 1903. With these improved calculations, hope for a visual fix on the elusive planet was renewed. With the aid of the brothers Vesto and Earl Slipher, Lowell spend the rest of his life scanning photographic plates with a hand magnifier and finally with a Zeiss blink comparator. In September 1919 William Pickering kicked off another search for “Planet O” based on deviations in Neptune’s orbit. Milton L Humason, from the Mount Wilson Observatory in California, started a search based on these new predictions as well as Lowell’s and Pickering’s 1909 predictions. This search again failed to find any new planets. Pickering continued to publish articles on hypothetical planets but by 1928 he had become discouraged. 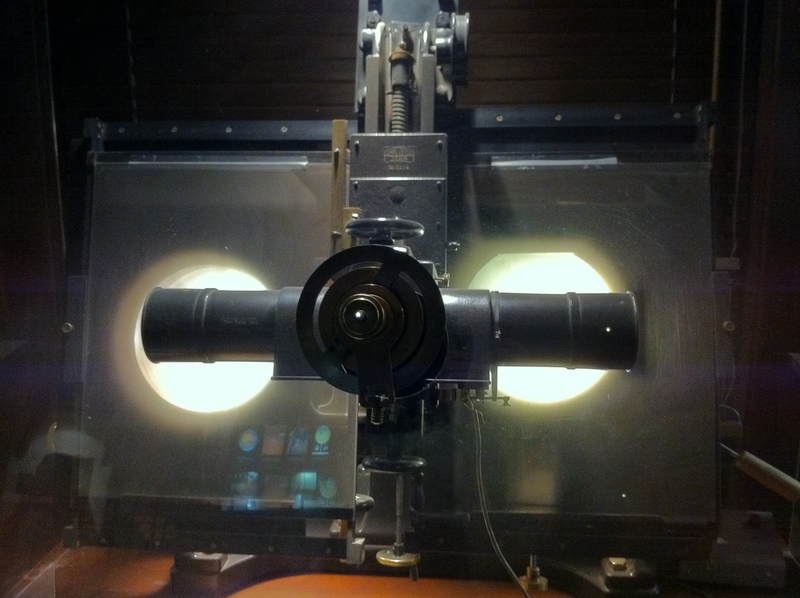 As part of Lowell’s legacy, the Lowell Observatory built a special astrographic telescope. It was completed in 1929, and under Vesto Slipher’s direction, a young assistant was assigned to take and examine the photographs of the farthest reaches of the solar system. His name was Clyde Tombaugh. This was grim, unglamorous work. Each plate was exposed for an hour or more, with Tombaugh adjusting the telescope precisely to keep pace with the slowly turning sky. Today a computer would make the comparisons, but in 1929 they were made by eye, manually flicking between two images. Stars would remain motionless while other bodies would seem to jump between views. Some images would have 40,000 stars, others up to 1 million. Nearly a year had elapsed when, on February 18, 1930, two images fifteen times fainter than Neptune were found among 160,000 stars on the photographic plates. The discovery was confirmed by examining earlier images. On February 20 the planet was observed to be yellowish, rather than bluish like Neptune. The new planet had revealed its true colours at last. Slipher waited until March 13 to announce the discovery. This was both Lowell’s birthday and the anniversary date of the discovery of Uranus. The announcement set off a worldwide rush to observe and photograph the new planet. Now that astronomers, amateur and professional alike, knew what they were looking for, it turned out that Pluto had been hiding in plain view. Re-examination of Humanson’s plates showed four images of Pluto from his 1919 survey, and there were many others. On March 14, an Oxford librarian read the news to his 11-year old granddaughter Venetia Burney, who suggested the name Pluto. It was also suggested independently in a letter by William Henry Pickering. To complete the circle, some of Clyde Tombaugh’s remains are in a canister attached to the New Horizons spacecraft. Most people alive today would not remember a universe without Pluto. And from 2015, its patterned surface will enter our visual vocabulary of the planets. Once seen, it can never again be unseen. Planet X, welcome to our world. Alice Gorman is Senior Lecturer in archaeology and space studies at Flinders University.